Our previous batch of bbq chicken meatball recipe never went to waste. 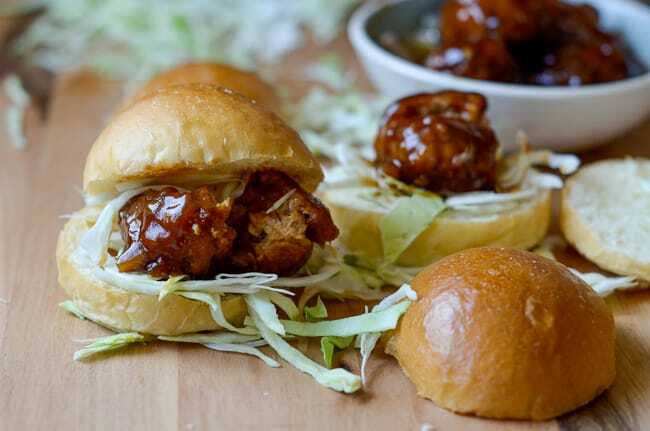 What we didn’t get to finish immediately went into chicken meatball sliders. We can’t think of a more perfect way to use the chicken meatballs. 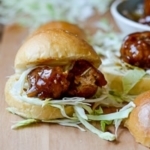 Within a matter of minutes, a warmed up batch of these meatballs, topped with some chopped cabbage and extra bbq sauce makes a perfect platter of sliders. 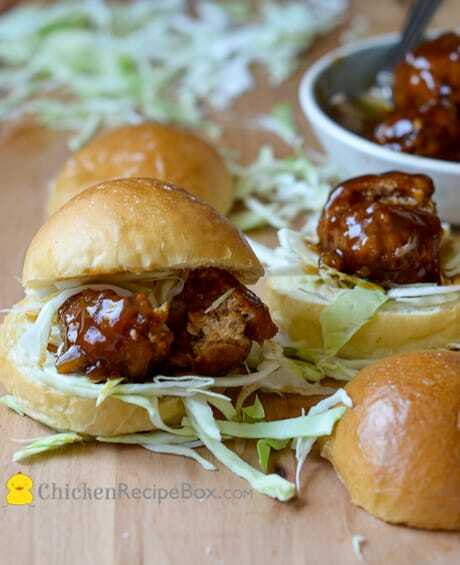 For parties, this is the perfect chicken appetizer dish or for those who want to eat 2-3 sliders, it’s like an entree. Eating 3 sliders is a full meal! Some of our favorite rolls to use are sweet hawaiian dinner rolls, which are perfect for sliders. For a less sweet version, we’ll try to find the smallest and softest mini-burger rolls we can find. For added fun, top the sliders off with some shredded cheese or pickles. What ever you want to use, go for it and make these sliders to your individual taste! More Chicken Recipes , Chicken Appetizer Recipes and Chicken Sandwich Recipes. Here’s the Video for the BBQ Chicken Meatballs. Recipe for the slider ingredients are listed below. 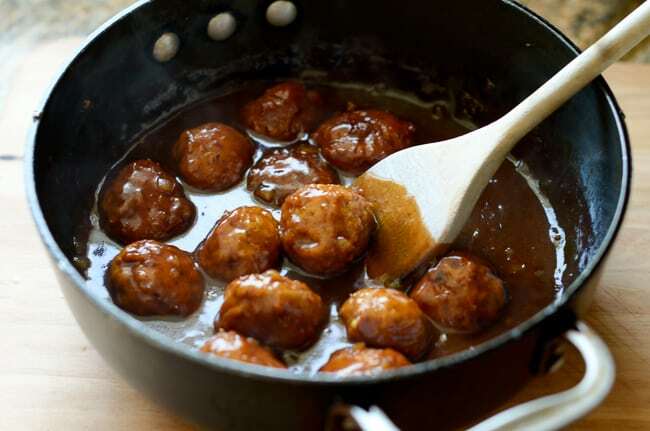 For the smoky bbq chicken meatballs recipe, click here. 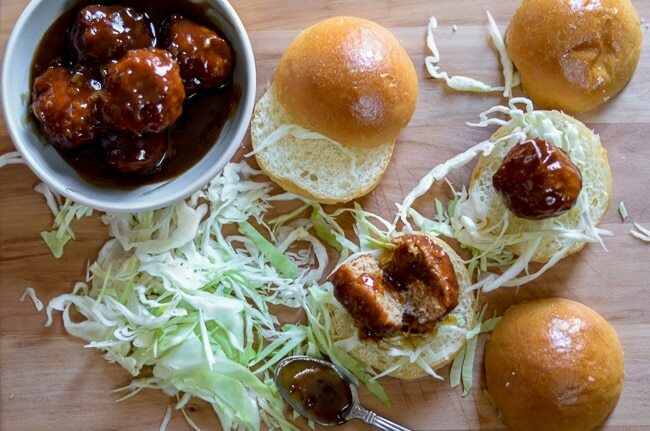 Assembly is easy, just lay meatball between the slider rolls and add your favorite toppings. Enjoy! These sliders look so lip-smacking, finger-licking good! Thanks for the awesome photos and the wonderful recipe.